In 1977, Fredrick Wesley Kernen, a local area farmer and former employee and graduate of the College of Agriculture made an offer to the university that was the largest gift ever by an individual at that time. To honour his parents, the late Frederick J. and Lucy Kernen, Mr. Kernen offered to gift two sections of prime agricultural land to the university, with full jurisdiction to operate on the lands. Included in the gift were 300 acres of native prairie land, which were to remain un-tilled and be used for ecological research. The station’s 380 hectares of cultivated land is adequate to provide for commercial production and small plot experiments. 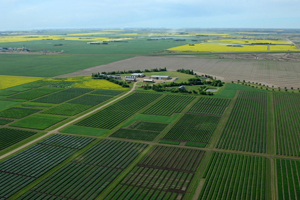 The Kernen Crop Research Farm is located at the intersections of Highways 5 and 41 on the quickly expanding east side of Saskatoon. Over the last 35 years, the site has accommodated ecological studies, grazing studies, crop breeding, crop production and crop and weed management research in the Department of Plant Sciences. Managed on a four-year crop rotation, the cultivated area of the farm also generates revenue, which helps support the cost of crop research and future development on the farm.